Another bugs fixing update happened at beginning of September. A simple XMMS frontend music player got next release, year later after previous. No big changes except for translations update and bugs fixes. Few updates for build using more recent auto-tools. Added compatibility with libnotify >= 0.7.0. Fixed crash if “id” is not available. Fixed crash in using xmmsv_get_* functions. Fixed crash on NULL passed to guess_title_from_url(). Fixed crash after deleting item from playlist. Eliminated duplicate gtk_widget_destroy() on main window which leaded to crash on exit. Fixed return value from lxmusic_do_notify_prepare() if no libnotify is available. It have to destroy any dialog windows on exit. Fixed few invalid casts and deprecated gdk_pixbuf_unref() calls. Allow compile with GLib >= 2.30 replacing deprecated functions. Added manual page lxmusic.1 to install tarball. Over two years since last release!? Yes it is true. We have not touched LXMusic since then. Mainly because the old maintainer left the LXDE upstream project. If you have an extra special connection to LXMusic please contact the main mailinglist and tell us about your plans for the client. We love to have a active maintainer for this piece of software. So what happened in the last two years? We have scrubbed the translation updates from the changelog below but there are alot of changes still mainly focused to notification updates and a rewrite of parts of that infrastructure. XMMS2 supports Album Art from various sources via picture_front property. LXMusic in master branch leverages this functionality to display album art in desktop notifications if available: Please test! play lists. Loading time for 3030 entries reduced from 7 to 0.5 seconds on a﻿﻿ ﻿Core 2 Duo T6500 system. Today Jürgen Hötzel of the LXDE development team released an updated verison of LXMusic. Download it at sourceforge. Request medialib info for whole playlist at once instead of requesting and updating each track successive. This improves speed for loading whole playlist a lot because we get rid of a lot of context switches between lxmusic and xmms2d. Use gtk_list_store_insert_with_values. This single call is is more efficient on large playlists than calling gtk_list_store_append and gtk_list_store_set (which emits also row_changed and rows_reordered signals). Previously playlist model/filter not freed when switching playlist. According to Google perftools this reduces heap usage from 24MB to 2MB when loading a 4000-track play-list! New week and time for an update regarding the translations for LXDE. During the last week some more users have started the translations in Pootle and by all means have delivered. Significant changes are noted in Danish that are 100% complete by now, good work! If you are new to Pootle and/or translation in general take a look at the crash course at the LXDE wiki and then go grab some strings. Just some spare minutes are needed to make some languages 100% complete, others could benefit a great deal from just some minutes of work and that coul add up to a complete translation. Start with the low hanging fruit, skip LXPanel if you are not too familiar with doing translations. For the other represented languages more actions are needed to make them complete, some are close to 80% with others only done in LXMenu-data that we have imported from GNOME. 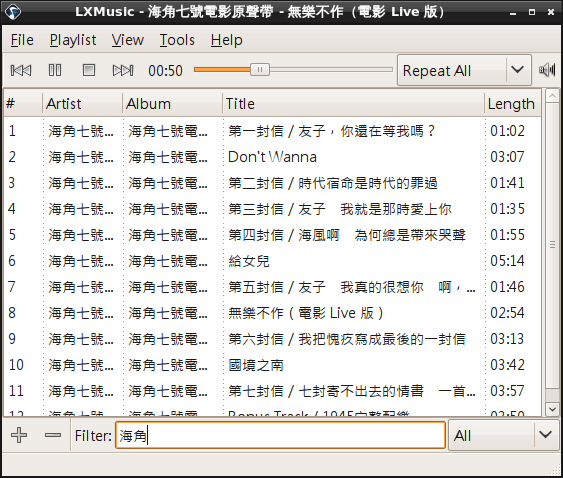 LXMusic – The minimalist music player for LXDE. This is based on xmms2, which is lightweight and has server/client design. The user interface is quite simple, clean, and intuitive. At first glance, it looks similar to my favorite player on Windows – foobar 2000. LXMusic only has very few features, and it can do nothing more than just playing a list of music files. However, this is what’s lacking today, a player which doesn’t try to teach you how to listen your own music files. It just plays! That’s all. It’s still under development and is still in alpha stage, but it’s enough for everyday use. Please grab the tarball or download the hotest code from LXDE svn repo to get it tested!